This timely film is an urgent, eye-opening look at the environmental, economic, and public health consequences of factory farming. How much do you know about the food that’s on your plate? 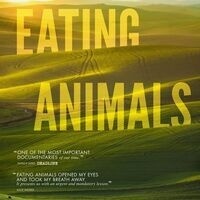 Based on the best-selling book by Jonathan Safran Foer, narrated and produced by Academy Award winner Natalie Portman, and directed and produced by Christopher Quinn, "EATING ANIMALS" explores the history of the factory farming system and its impact on our economy, health, and environment. Taking viewers to American family farms, markets in China, and pioneering food labs, the film introduces farmers, ranchers, whistleblowers, and innovators working to help the public be as well-informed and well-fed as possible.